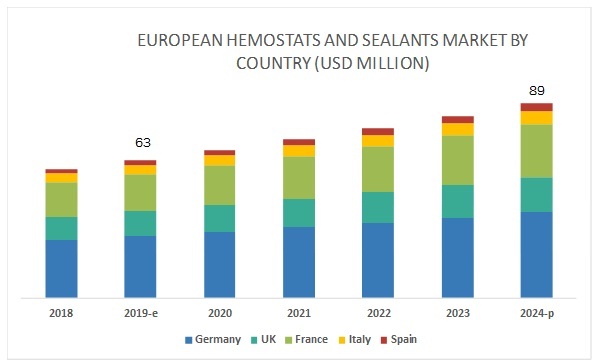 [33 Pages Report]The European hemostats and sealants market is projected to reach USD 89 million by 2024 from USD 63 million in 2019, at a CAGR of 7.0%. The growth of this market is majorly driven by the launch of new products and favorable reimbursement scenario. However, the shift toward minimally invasive surgeries and adverse effect of hemostats are the major factors restraining the growth of this market. 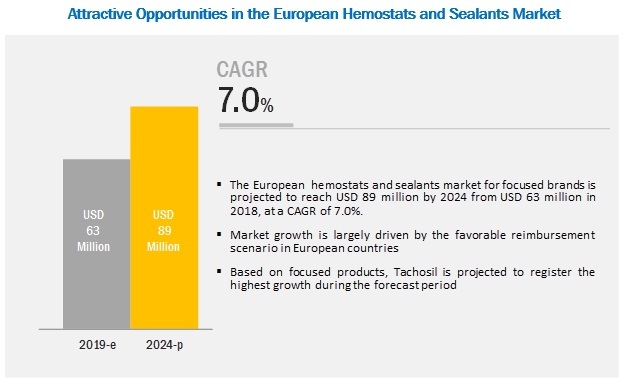 Tachosil is expected to dominate the European hemostats and sealants market over the forecast period. By product, the European hemostats and sealants market (for focused brands) is segmented into Tachosil, Lyostypt, Sangustop, Veriset, Avitene, and Hemopatch. Tachosil accounts for the largest market share and is anticipated to grow at the highest CAGR during the forecast period. This share can be attributed to high awareness about the brand among end users in European countries. The European hemostats and sealants market is geographically segmented into Germany, UK, France, Italy, and Spain. While Germany dominated the market in 2019, the UK is expected to register the highest CAGR in the market during the forecast period. Germany holds the largest share amongst all the European countries, owing to its larger patient population and comparatively higher number of surgeries, which will require the usage of hemostats and sealants. Some of the prominent players in the European hemostats and sealants market are B. Braun (Germany), Medtronic (Ireland), C. R. Bard (US), Takeda (Japan), and Baxter (US). What are the growth opportunities in the hemostats and sealants market across major countries in Europe in the future? What are the key drivers and restraints in the hemostats and sealants market? What are the key brands in the hemostats and sealants market? Which are the key countries in the hemostats and sealants market? What are the most preferred brands amongst end users? The study involved four major activities to estimate the current size of the hemostats and sealants (focused brands) market. Exhaustive secondary research was conducted to collect information on the market and its different subsegments. The next step was to validate these findings, assumptions, and sizing estimates with industry experts across the value chain through primary research. Both top-down and bottom-up approaches were employed to estimate the complete market size. Thereafter, market breakdown and data triangulation procedures were used to estimate the market size of segments and subsegments. To complete the overall market engineering process and arrive at the exact statistics of each market segment and subsegment, the data triangulation and market breakdown procedures were employed, wherever applicable. The data was triangulated by studying various factors and trends from both the demand and supply sides in the hemostats and sealants industry.